Is autumn the best time of year to visit Melbourne, Australia? Autumn in Melbourne. An excuse to get out and Photograph. It's Autumn time in Melbourne but someone forgot to tell the weather. Another 26 degree day is forecast for tomorrow, but I'm not complaining. It's one of the best features Melbourne has to offer; never knowing what to expect from the elements from day to day, hour to hour. 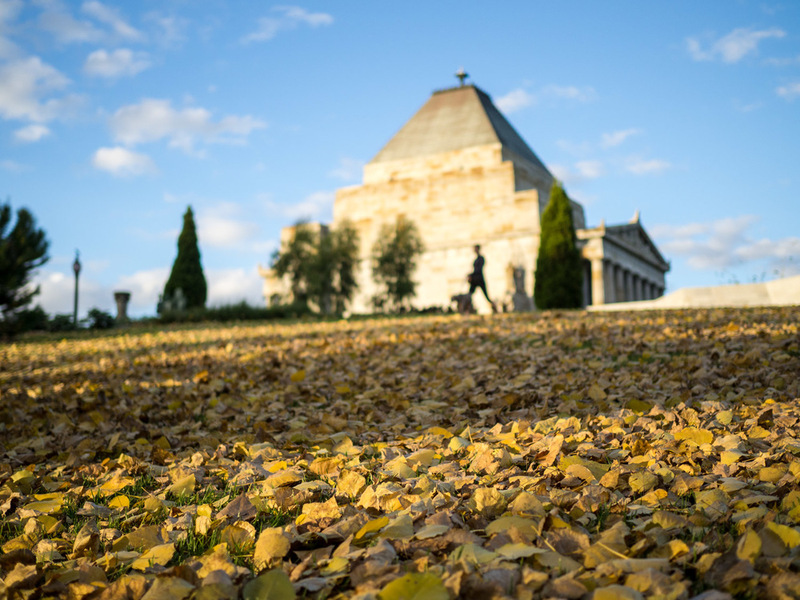 Autumn leaves cover the ground in front of the Shrine of Remembrance, Melbourne. It has however been a great time to explore the Botanical Gardens near my apartment. The Shrine of Remembrance nearby looks fantastic all year round but with the Autumn colours starting to show in the gardens it adds something quite special to the area. I wanted to try and capture the traditional autumn colours while showing off the Shrine itself. For that I got low to the ground and set the EM10 with 25mm lens wide open. I am quite pleased with the result! I have a version without the lady walking her dog but I quite liked this addition. Falling Autumn leaves in the Botanical Gardens, Melbourne. No seasonal photograph set is complete without a shot of falling leaves, is it? Well I thought not too so I did spend a bit of time capturing this one. It wasn't an easy one but great fun and I hope it shows off what Autumn in Melbourne's Botanical Gardens is all about - sun, colours, just a great place to be. Is Melbourne better in the Autumn? I think it's fantastic all year round but definitely really special at the moment. Bearable temperatures and stunning colours on show make for a pretty great combination for photographers, visitors and locals alike. What's your favourite time of year to see Melbourne, or any other city for that matter?